The small mountain town of Madaya in Syria is about 40 km north-west of Damascus. At this time of the year, it is often covered in snow, especially in January and February. Its attractions included Lake Barada, and in the past Madaya was known for its healthy climate and fresh waters and, so that it was once a popular holiday resort. Since last July, however, Madaya has been under siege from a combined force of Syrian troops loyal to President Bashar al-Assad’s government and the Shia militia Hezbollah. But the plight of Madaya only came to wider international attention earlier this month [January 2016], and eventually a humanitarian aid convoy entered the town last Monday [11 January 2016]. At the same time, another aid convoy entered al-Fu’ah and Kafriya, two neighbouring towns under siege from anti-government rebels. As the world’s attention was drawn to the plight of Madaya, there was a simultaneous and palpable rise in resistance across Europe to accepting Syrian refugees and asylum seekers. In its latest edition this week, the French satirical magazine Charlie Hebdo stooped to a new low with a cartoon that is sparking a new debate about racism in Europe. The cartoon depicts the drowned three-year-old child Alan Kurdi, suggesting he might have grown up to be a sexual abuser in Germany like the immigrants allegedly involved in recent assaults in Cologne. Many other comments across Europe this week suggest public opinion is turning towards saying the plight of Syrians must be dealt with in Syria, but please do not bring Syrians here. The plight of the residents of Madaya played on my mind and my memory in a form of wordplay as I thought of Medea, the great classical Greek tragedy about the fear of the foreigner and about confusion that arises about the sexuality of the other when we objectify the foreigner in our midst. I first started to try reading Medea in the original Greek of Euripides almost 30 years ago when, following a course in Biblical Greek, I began a Cambridge course in Classical Greek. Shortly afterwards, I was in Rethymnon in Crete when Medea was staged using the original text in theatre in the Fortezza. Of course, this is a familiar story in Crete and Medea herself is associated with the Cave of Melidoni is near the village of Mylopotamos, in the mountains above Rethymnon. During the Minoan era, the cave was a centre for the worship of the mythical bronze giant of Crete, Talos, who was believed ensured the safety and the security of the island. The giant robot ran the round of Crete twice a day, but legend says that Medea removed the tack that protected his only vein, his vital fluid flushed out, and Talos died. Medea (Μήδεια) is a tragedy by Euripides, based on the myth of Jason and Medea, and it was first produced in 431 BC. The plot centres on the actions of Medea, a barbarian and the wife of Jason. After the adventures of the Golden Fleece, Jason takes his wife Medea into exile at Corinth. However, he then leaves her, seeking to advance his political ambitions by marrying Glauke, the daughter of King Creon of Corinth. Medea seeks vengeance by killing Jason’s new wife, his father-in-law and the children Medea had with Jason. Having taken her revenge, she escapes to Athens to begin a new life. This tragedy is generally considered the best play written by Euripides and one of the greatest plays ever. However, it only came third when it was presented at the Dionysia Festival in 431 BC. This may have been because of the extensive changes Euripides made to the conventions of Greek theatre in the play. These include an indecisive chorus, implicitly criticising Athenian society and by showing disrespect for the gods. As with most Greek tragedies, the play does not require any change of scene and takes place throughout outside the façade of the palace of Jason and Medea in Corinth. Events that occur off-stage, such as the deaths of Glauke and Creon and Medea’s murder of her children, are described in elaborate speeches delivered by a messenger, rather than enacted before the audience. Although there are virtually no stage directions, Medea’s appearance in a chariot drawn by dragons towards the end of the play probably required a construction on the roof of the skene or suspended from a mechane, a kind of crane used in Greek theatres for flying scenes. The play explores many universal themes. It deals with passion and rage, for Medea is a woman of extreme behaviour and emotion, and Jason’s betrayal of her has transformed her passion into rage and intemperate destruction). It discusses revenge for Medea is willing to sacrifice everything to make her revenge perfect. It explores greatness and pride. In classical Greece, people were fascinated by the thin line between greatness and hubris, or pride, and the idea that the same traits that make a man or woman great can lead to destruction. It asks us to consider how we deal with the Other. Medea’s exotic foreignness is emphasised, and is made worse by her status as an exile. But Euripides shows during the play that the Other is not exclusively something external to Greece. It confronts our prejudices about intelligence and our abilities to be manipulative. Jason and Creon both seek to be manipulative, but Medea is the great manipulator, playing on the weaknesses and needs of both her enemies and her friends). It challenges our concepts of justice in an unjust society, especially where women and foreigners are concerned, and so it is seen by some as one of the first works of feminism. Medea’s opening speech to the Chorus is the most eloquent statement in classical Greek literature about the injustices that befall women. Indeed, the relationship between the Chorus and Medea is one of the most interesting in Greek drama. The women are alternately horrified and enthralled by Medea, living vicariously through her. They both condemn her and pity her for her horrible acts, yet do nothing to interfere. Is Medea a monster because she is a foreigner or because of the way she is treated by the men in her life? How do we react to a foreigner who moves beyond being the object of our pity and is seen as noble, proud, efficient, and unwilling to be the object of pity, to be marginalised, to be denied rights, to continue to be treated as the outsider? The form of the play differs from many other Greek tragedies by its simplicity. All the scenes involve only two actors, Medea and someone else. These encounters serve to highlight Medea’s skill and determination in manipulating powerful male figures to achieve her own ends. The play is also the only Greek tragedy in which a character kills family members yet remains unpunished by the end of the play, and the only play about child-killing in which the deed is performed in cold blood rather than in a state of temporary madness. Medea exposes the false pieties and hypocritical values of her enemies, and uses their own moral bankruptcy against them. Her revenge is total, but it comes at the cost of everything she holds dear. She murders her own children in part because she cannot bear the thought of seeing them hurt by an enemy. Jason, on the other hand, is a condescending, opportunistic and unscrupulous man, full of self-deception. The other main male characters, Creon and Aegeus, are weak and fearful, considering only their own interests and ambitions. When it was first staged in Athens in 431 BC as one of plays at the City Dionysia, Medea shocked the judges and the audience and came last. Each year, three playwrights competed against each other at the festival, and in 431 the competition was between Euphorion, the son of Aeschylus, Sophocles, who was the main rival of Euripides, and Euripides. Euphorion won, and Euripides was placed last. The City Dionysia (Διονύσια τὰ ἐν Ἄστει) or Great Dionysia (Διονύσια τὰ Μεγάλα) was an urban festival celebrating the end of winter and harvesting the year’s crops. The Theatre of Dionysus Eleuthereus is sometimes confused with the later and better-preserved Odeon of Herodes Atticus, on the south-west slope of the Acropolis. It is one of the earliest theatres in Athens, and is considered the first theatre in the world. It could seat 17,000 people, compared with the theatre in Epidaurus, which can still seat 14,000 people. Euripides’ characterisation of Medea exhibits the inner emotions of passion, love, and vengeance. Until then, tradition said Medea’s children were killed by the Corinthians after her escape. Euripides’s retelling of the story so that Medea kills her own children might have offended his audience. Medea is set in Corinth some time after Jason’s quest for the Golden Fleece, where he met Medea. The play opens in a state of conflict. Jason (Ἰάσων) has abandoned his wife, Medea, along with their two children. He hopes to advance his place in life by marrying Glauke (Γλαυκή), the daughter of Creon (Κρέων), the King of Corinth. 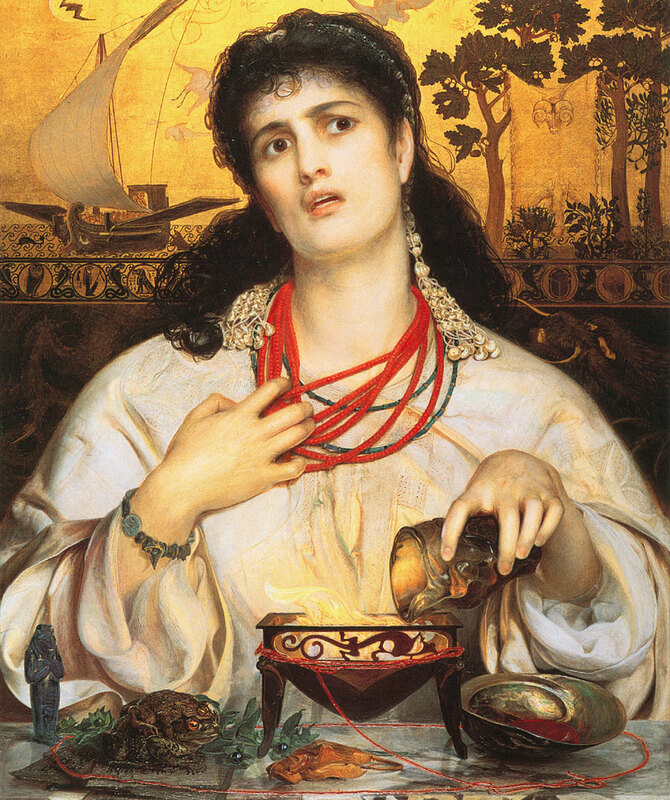 Medea grieves over the loss of her husband’s love, and curses her own existence, as well as that of her two children. Her elderly nurse and the Chorus of Corinthian women, who are generally sympathetic to her plight, fear what she might do to herself or her children. King Creon fears the possibility of revenge, and so he banishes Medea and her two sons from Corinth. Medea pleads for mercy, and is granted one more day before she must leave. It goes against his better judgment, but he allows it out of pity for Medea’s two sons. However, Medea is not the sort of woman to take mistreatment easily, and she plans swift and bloody revenge through killing Creon, Glauke and Jason. Medea needs to secure a safe place to retreat to once she has committed the murders. By chance and by coincidence, Aegeus, King of Athens, appears on the scene. He has no sons and heirs, and Medea promises to cure his sterility if, in return, he gives her refuge. Of course, she does not mention she is about to so many people. With a guarantee of a safe haven in Athens, Medea has cleared all obstacles to completing her revenge. Her plan grows to include the murder of her own children. The pain their loss will cause her does not outweigh the satisfaction she will feel by making Jason suffer. Now that Medea has a promise of a safe exile, Medea develops her plan. She pretends to Jason that she understands his new marriage. Medea begs her husband to ask Glauke to secure promise from her father that their two sons can stay in Corinth. Jason is moved and agrees. Medea gives Jason a gossamer dress and a golden crown as gifts for Glauke, but does not tell him that the gifts are cursed. The coronet and dress are poisoned, and their delivery causes Glauke’s death. Seeing his daughter ravaged by the poison, Creon chooses to die by her side by dramatically embracing her and absorbing the poison himself. A messenger returns and tells Medea the gruesome details of these deaths. When the princess put on the gown and crown, her entire body caught fire and her flesh melted from her bones. King Creon is so distraught when he sees his daughter’s flaming corpse that he throws his body onto hers and dies as well. Medea listens to all this with cool attention to the detail. Her earlier state of anxiety, which intensified as she struggled with the decision to kill her children, now gives way to an assured determination to fulfil her plans and so leave Jason totally devastated. Against the protests of the chorus, Medea murders her children. The murder of her children is not easy for Medea. She struggles with her motherly instincts, but in the end her revenge is more important. She drags the boys inside the house and kills them with a sword. Jason arrives too late to save his sons. Medea flees the scene, escaping in a dragon-pulled chariot provided by her grandfather, the sun-god. Jason is left cursing his lot. He begs to have the children's bodies so that he can bury them. She refuses him even this, and takes their corpses away with her as she flies away triumphant. So have things gone, this whole experience through! My early memories of Medea are the 1963 film Jason and the Argonauts, in which Medea, played by Nancy Kovack, is portrayed as a Temple Dancer who is saved by Jason after her ship sinks, and the 1969 film Medea, directed by the Italian director Pier Paolo Pasolini and featuring the Greek opera singer Maria Callas in the title role. Recently, a new translation of the play by Kenneth McLeish and Frederic Raphael was staged in the Abbey Theatre, Dublin [June 2000]. When Medea was staged in the National Theatre in London in August 2014, the Guardian interviewed two actors, Helen McCrory and Diana Rigg, who played the role 20 years apart and spoke about why it still resonates. As part of the celebrations last year marking the 90th birthday of the Greek composer Mikis Theodorakis, the film Recycling Medea directed by Asteris Koutoulas had its world premiere last summer . Koutoulas has been Theodorakis’ music producer and manager abroad since 1986 and has worked with him in many countries. This film is a hybrid ballet performance music and political documentary film collage, with a poignant relevance given the present crises in Greece. This film by Asteris Koutoulas includes music by Mikis Theodorakis, with choreography by Renato Zanella and featuring Maria Kousouni as Medea. The classical Greek tragedy serves as an astute metaphor for the current Greek political, social and economic tragedy. Medea kills her own children. Society has turned against its offspring and thus kills their future. The balletic retelling of a mother murdering her two children is based on the play by Euripides. Script, sound and dance join force in a powerful film reflecting the desperation of a society that spent all of yesterday turning its children into today’s lost generation. These protagonists are flanked and contrasted by the disturbingly mild-mannered 15-year-old Bella, who is innocence incarnate but is destroyed by the hand of a hostile and selfish world. Against this background, she seems an almost unreal, fictitious character. On the other hand, there is no fiction in the words of Anne Frank, hidden away in her Amsterdam hideout and filling the pages of her diary. Another child victim of racism in Europe lends today’s isolated and trusting Bella her “voice” and thoughts. Medea, Jason, Bella and Anne Frank, composer and protester Theodorakis, the dancers, the rebelling hooded teenagers, advancing police, the choreographer and camera crew – they all become (in)voluntary actors in this complex tragedy spanning the ages. Recycling Medea has been dedicated to the betrayed youth – and their parents who sacrificed the dreams and future of their own children. But if Medea is relevant to Greece’s problems today, I cannot help thinking it is also relevant to the problems of the people of Madaya and our responses in Europe to the foreigners we refuse to accept among us. Je suis Charlie? Non. Je ne suis pas Charlie. Je suis Alan Kurdi.